What is a "Death Pool" at a fighting game tournament? The “death pool” is an uncapped, unseeded bracket containing players who sign up for an event past the late registration date. As fighting game events get ever larger, tournament organizers within the community have had to innovate and think of new ways to make the experience of an FGC event better for the hundreds, and potentially thousands, of additional players attending their events. With increased attendance comes an increased responsibility and demand on resources that are required to run fighting game events effectively. With the attention, attendance, press, and spectacle at fighting game events on the rise, expectations for an unforgettable spectator and competitor experience are rising right along with them. As a result, it has become increasingly important for tournament organizers and their teams to not only forecast attendance, but create a more consistent, balanced, and streamlined experience for every single competitor in attendance. 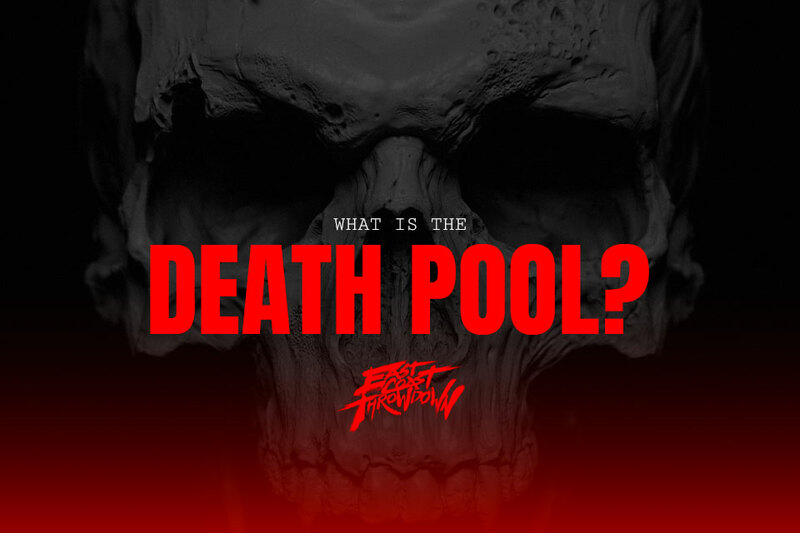 An increasingly popular trend utilized by tournament organizers of FGC esports events over the past few years to help stabilize the event experience for the majority of attendees has been the dreaded “Death Pool” or “Pool of Death”. An uncapped pool means that the pool of death can have as many entrants as people who sign up; there is no player limit. Since the pool is uncapped, this immediately means that players will likely have to play more matches than in normal registration pools. In a normal 16-person bracket, with two players advancing out of the pool, a player who makes it out strictly in winners will have to play four times; going to losers first round could mean as many as seven matches. In a “death pool,” however, the number of matches can vary wildly: a 64-person bracket would only increase the number of matches a winner has to play by one, but someone who goes into losers first round would have to play 11 times to make it out of the pool. And both numbers would only increase if the number of players increases. Also affecting a player’s ability to make it out of a death pool is the unseeded nature of the bracket. In an unseeded pool, there are no restrictions on where a player ends up in the bracket; players are placed randomly. This means matchups that might not happen in a seeded tournament pool could, and often do, happen. Two former top eight placers might have to compete in the first round, or training partners who live within five minutes of each other. These factors add up to create a tough road for players looking to earn points toward current pro tours. The Injustice Pro Series and Capcom Pro Tour both offer points to high-placing competitors—IPS to top eight or 16 depending on the level of the event, CPT to top 16 or 64—but the points offered drastically decrease outside of the top four (both are below 100 points earned after fourth place). In fact, to make top eight in the Capcom Pro Tour standings by earning less than 100 points per event, a player would have to go to 13 events. And that is without anyone else in the standings gaining points themselves. Having to play in a “death pool” makes an uphill battle even steeper for players looking to earn these significant tour points. A larger bracket means playing and waiting to play for much longer periods of time. Fatigue becomes a big threat to player performance due to all the additional matches, and the number of “land mines,” top players or difficult matchups, increases. Even if a player makes it out of a “death pool,” they will still have to play more games that day to qualify for or become eligible for pro tour points. Players can avoid “death pool” brackets by registering in advance of upcoming events. This early registration entitles players to seeding according to location and skill level, which means that players will largely face players outside their normal scene or region and that top competitors will not be forced to battle one another in the early rounds of the event. Registering during the early registration period for fighting game tournaments can also offer substantial savings. The average tournament fee doubles from the earliest registration period to the close of late registration, costing players at least $25 more to register late, so the sooner a player signs up the less it costs them. Players who register early can also save money by taking advantage of the discounts usually offered on hotel rooms during this time which are normally all booked up by the end of late registration. Lastly, some events even offer players added bonuses for early registration, such as entrance into a raffle or discounts on official event products.